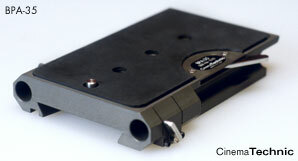 I have a very limited quantity of the CinemaTechnic Superlite Baseplate available. These are updated units, compatible with the ARRI 16SR 1-2-3, (LWBP-16) or available in a 35mm version (LWBP-35) that uses a different top plate. NOTE: We are considering producing a very limited one-time run of adapter plates for the Aaton LTR/XTR series Super 16 cameras to be used with our LWBP-16. This will be a one-time deal. If you’re interested let us know now. The LWBP-35 is compatible with any camera that conforms to ARRI standards and works with standard ARRI bridgeplates. The new units will be lighter than the original version due to an updated design. Black anodizing is standard. The hard coat anodized finish is only available as special order for additional cost. 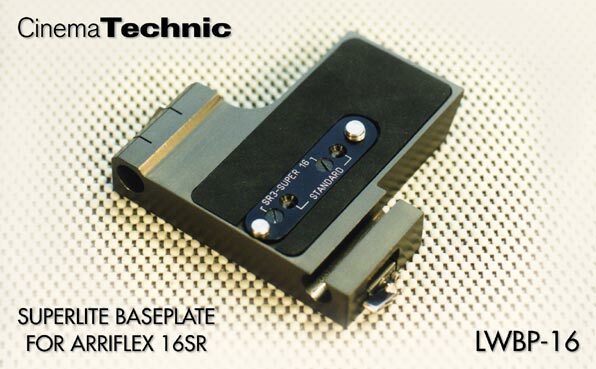 The CinemaTechnic LWBP-16 Superlite Baseplate is the first CinemaTechnic camera accessory. Its development dates back to December 1999. The first prototype was ready by January 2000 and I used it with my 16SR until 2004. A few partially machined units were made around that time and ended up getting set aside. I am now working on updating the design and I will complete the units on hand and offer them for sale. Once they are sold, no more will be made. The new units are 16mm / 35mm switchable via a detachable top plate. After 10 years experience shooting with the Arriflex 16SR., I was frustrated by the awkwardness of the standard ARRI BP-7 bridgeplate for the 16SR when shooting hand-held. I preferred using the ARRI Studio Follow Focus II at all times, as I was never a fan of the original Lightweight Follow Focus. I also would often use my custom 4 x 5.650″ Matte Box (the first CinemaTechnic product) hand held. Finally when I bought my Angenieux 11.5-138mm HR Super 16 zoom lens, I had to use a lens support at all times. I knew I had to come up with something better than the original ARRI Bridgeplate, or the ARRI LWS “mini-rods”. 1) It securely holds the 15mm rods with enough rod length in the bores to provide the needed support to the rods, which I frequently use as handgrips. It uses secure clamps that grip the entire circumference of the support rods, not just thumb screws which are not secure and scar up the rods. 2) It attaches to the bottom of the 16SR exactly like the full sized ARRI Bridgeplate, and it will not allow the camera to rotate. It is no larger that what is needed, and is cut away with a 45º bevel at the rear so it will not interfere with the operators shoulder. Yet is easily strong enough to support the weight of the 16SRII with Studio Follow Focus, Full Sized Matte Box, and 6.5 pound 11.5-138mm zoom lens. You can confidently turn the entire rig, as described above, and hold it upside down by one rod. You will not feel the LWBP-16 budge. And, best of all, the CinemaTechnic LWBP-16 accomplishes all the above while weighing only ONE POUND, including a pair of 9.6 inch x 15mm Carbon Fiber support rods! . In fact, I have not used my standard ARRI BP-7 Bridgeplate since the first prototype LWBP-16 was finished. Above is a photo of my 16SR with the LWBP-16 and optional Carbon Fiber rods. The rig, as pictured below, comes right off my Sachtler 7+7 head and onto my shoulder in seconds. The balance point (center of gravity) is right in the center of the LWBP-16. Below: BPA-35 Bridgeplate in Titanium Finish. 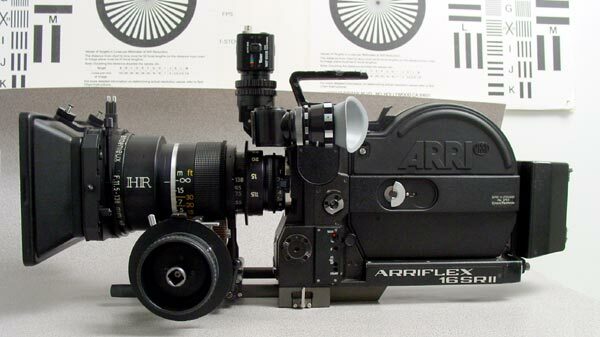 Fits Arriflex 35 III and 35 BL I – IVs. Fits Arriflex 35IIC with Cinematography or Tobin motor base. Click on the image for a larger photo. All CinemaTechnic Bridgeplates are made from aerospace quality hardened, heat-treated 6061-T651 aluminum. Because we machine each product from a solid piece of aluminum, we avoid the porosity that weakens other aftermarket products made from sand castings. Our Bridgeplates are protected by a super-hard, military-spec hard anodize coating. We call it Titanium Finish because the color is very similar to titanium alloy, but it’s even harder than titanium. We coat the aluminum with 40 microns of super hard aluminum oxide, one of the hardest materials known. Our coating is 25% thicker than the coating used on the original equipment bridgeplates. On lesser quality aftermarket Bridgeplates, long-term use can wear out the anodizing. This is because the use the less expensive and easier to obtain Type 1 or Type 2 (Chromic or Sulfuric) anodizing, which builds up only 5 microns. Have you ever noticed areas where the black color has worn off on cameras or accessories? You are seeing Type 1 or 2 anodizing that has been worn off. The top and bottom halves of our Bridgeplates are available separately, or in sets (except the LWBP-16 which does not require a lower half). Because our Bridgeplates are made to such high standards for accuracy, you can combine them with any original ARRI Dovetail Balance Plate and they will fit perfectly. We offer a 5% discount on the listed prices if you purchase the top and bottom halves together as a set. Takes the place of a standard bridgeplate and dovetail baseplate. Allows going from sticks to hand-held in seconds. Accepts standard Sachtler-style quick release plates, (not included) both small and large version. Made from high quality 6061-T651 hardened wrought aluminum using high-density solid bar stock with no voids. Stronger than cast aluminum used by ARRI. Type II black anodized finish. Corrosion resistant. Top plates are available for Super 16 or Super 35 centering only. Standard 16/35 centering top plates are special order only. Precision machined to within tolerances of less than 12µm (5/10,000 in) of ARRI standards. Each unit is serial numbered.